10 applications of database in a fun online IT learning game. 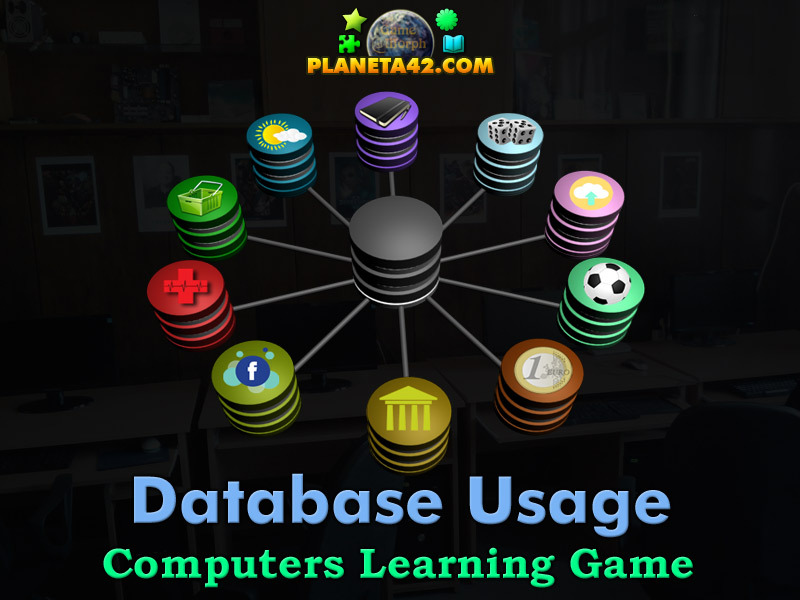 "Database Applications" is a free online knowledge level game to explore and study the usage of database. Minute to win it game. Computer Technology Class for desktop computers, laptops and tablets, which may be played in the web browser. Sort the application of the database by color. Computers learning game, suitable for online classes and interactive lessons. Free online educational game. Lesson 1a for 10 grade clasroom game. How to play Database Applications. There are 10 pictures at the top of the screen, representing different field of usage of the database. Drag and drop them in the socked with the same color. Sort all 10 pieces to win the game. Know where databases are used and get +1 Knowledge Level. Databases are widely used on the Internet to store a variety of information: online dictionaries and encyclopaedias, library catalogs, bank depositor accounts, millions of search engine-indexed websites, online merchant catalogs, and more. The use of databases is becoming more and more popular. The information in the databases is arranged in a certain way, which makes it possible for the computer to be processed. For example, the most common in the Internet relational databases sort the information in the form of tables. Each table has rows, columns, and row numbers very similar to an Excel spreadsheet. In fact, many relational databases allow immediate input of Excel table data, as can be seen in the previous game.